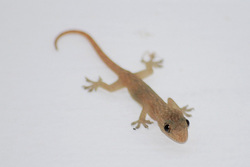 Size - House geckos are very small animals, adults can range in size from about 3 inches to up to 5 inches. Housing - A 20 gallon will house a single gecko or a pair, a vertical tank is generally better than a horizontal ones because House geckos climb so much. Be sure to provide places for climbing such as branches or plants as well as above ground and on-ground hiding spots where the gecko can go to when they feel threatened. Non-toxic plants are great for creating hiding spots and for collecting water from misting. Never, ever put more than one male in one tank. Also never put a male and female unless you are ready to care for the eggs which you most likely aren't unless you have kept geckos in the past. For a child or a beginning house gecko keeper one gecko is the best. Substrate - Use pelleted or mulch-type unless the geckos eat the substrate in which case you should either use an edible substrate or something that they cannot eat such as newspaper or a special carpet for reptile cages. It is important to do this because eating the substrate can cause serious injury to the gecko and its digestive system. Temperature - Day time temperature should be from75 degrees F to 88 degrees F under the basking light. At night 70 degrees F. Humidity of about 65% should be maintained in the habitat at all times this can be achieved by regularly misting. We Recommend radiant heat; use an incandescent light or ceramic heater as primary heat source Lighting. Provide fluorescent light for 10 to 12 hours a day; incandescent bulb is needed for basking area if not using a ceramic heater. Water - Although you may want to provide a small bowl that the gecko can't fall into it is also important to mist the tank to maintain humidity and always the gecko to drink off of leaves and sides of the tank. Lighting - Provide fluorescent light for 10 to 12 hours a day; incandescent bulb is needed for basking area of about eighty-five degrees F and this can be achieved with a clamp lamp using a sixty watt bulb. Feeding - Young House Geckos must be fed every day. When they reach adulthood every other day is a sufficient feeding schedule. A proper diet for a house gecko consists of a variety of insects which include small crickets, mealworms and waxworms. These insects should gut-loaded with supplements that can be bought either from a pet store or online. They can be quite expensive but are worth it for the health of your gecko. It is also important to provide a vitamin and calcium supplement. These are generally daily or weekly but be sure to read the instructions on the supplement for full instructions.